While we can help you buy real estate in any of the Park City and surrounding communities, this page is focused on real estate in the geographical neighborhoods inside the Incorporated areas of Park City (City limits). These Park City real estate communities have both residential and vacation homes for sale. Other real estate areas can be found on our Communities page! Old Town - the neighborhoods around Main Street as well as the streets around the Park City Mountain Resort. Shorter driveways, many one car garages, 25'x75' lot sizes in most cases. Real estate Homes range in age from the 1890's to present day. The Aerie - on the steep hillside to the East of Old Town, off of Deer Valley Drive. Fantastic views, with a mixture of mountain homes and contemporary homes. April Mountain is within this area as well. Thaynes Canyons - Located on the West side of Hwy 224 as you're coming into town. Everything from the Big White Barn to the Park City Mountain Resort. Tucked in the trees, it's a locals favorite and its adjacent to the Park City Golf Course. Park Meadows - the largest neighborhood of its kind in the city limits, homes and condos built in the 1970's through today with the Park Meadows private golf course situated in the center. McLeod Creek, Eagle Point and Fairway Meadows are included in this area. Prospector - One of the older residential real estate areas in Park City, Prospector is within walking distance to the Park City High School, Treasure Mountain Middle School, and McPolin Elementary School. Deer Valley - Named #1 ski resort in North America not once, but three times. Real estate areas include Lower Deer Valley, Upper Deer Valley, Deer Crest and Empire Pass/Flagstaff. Luxury ski-in ski-out homes and condos and well as many primary residence are found in Deer Valley. To identify which neighborhoods are zoned for primary residents and which allow vacation nightly rentals, please give us a call at 435-901-2781 or fill out the contact us form. Visit Park City MLS Communities to search real estate in the unincorporated areas of Park City including the Canyons, Olympic Park, Silver Springs, Jeremy Ranch, Promontory, Glenwild, and Jordanelle. In 1872, George and Rhonda Snyder named the mountain town known at that time as Synderbasin to Parley's Park City, and later shortened to Park City. Swept away by the lush grasses and colorful wildflowers, Snyder christened the area, "...Park City, for it is a veritable park." In 1884, Park City incorporated. Although Park City was a tremendously successful mining town, the history of the city and it's real estate had difficult times. Park City suffered terrible fires in 1882 and then again in 1885. 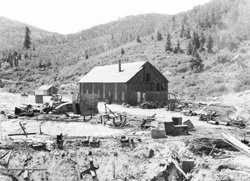 However, the worst disaster came on June 19, 1898 when a devastating fire raged through the Park City commercial district. The blaze was the greatest in Utah history. Main Street destroyed, only a few gaunt walls remaining. Losses were estimated at over one million dollars. With the low cost of real estate in 1898, I'm sure a million dollars was a hefty amount. Approximately 200 business houses and dwellings perished. The city was left in ruins. With community support the people of Park City banded together and rebuilt their town. Several fine structures, including the Grand Opera House, City Hall, and the Park City Bank had perished in the blaze. Many stone and brick structures were rebuilt quickly with wood buildings, which were later improved again to brick and stone. By the 1920s Park City was rebuilt completely. Today, main street still retains its look as a picturesque, nineteenth centry mining town. This look is part of the attraction that draws people to invest in Park City real estate by purchasing a vacation home or ski condo and others to purchase and call it "Home.". Park City, Utah is now famous for three world-class ski resorts: Park City Mountain Resort, Deer Valley, and The Canyons. Home to the Utah Olympic Park, Park City hosted several of the 2002 Olympic venues. Nearby Heber, Utah, is also home to Olympic glory. Soldier Hollow, the cross-country ski and biathlon venue for the 2002 Olympics, remains open to visitors. For the warm weather visitors, Park City Real Estate offers excellent golf communities, hiking, biking, fishing, and plenty of Park City sponsored activities. There are few places in the world where you can find remote wilderness and a cosmopolitan resort in the same area. Park City is such a place. World-class skiing, fishing, golf, cultural events and nightlife abound in Park City. In the surrounding area, the rustic, solitary life of farmers and ranches prevails. Why not let me find your Park City Real Estate based on criteria specified by you. I can setup an automated search for Homes or Condos for Sale in any neighborhood you request. This will automatically email you when new real estate listings become available. Just fill out the Email Cindy or you may also contact us at 435-901-2781.